The geopolymer mortar is centrifugally cast from atop a sled, which is slowly removed from the pipe to provide a uniform application. Typical application thicknesses range between 1 and 3 inches. The use of geopolymers in modern industrial applications is becoming increasingly popular based on both their intrinsic environmental and performance benefits. Historically, trial applications of geopolymers were first used in some concrete applications by Glukhovsky and coworkers in the Soviet Union post-WWII; the geopolymer was then known as “soil cements”. GeoSpray is a proprietary geopolymer mortar specially formulated to meet all the physical and chemical requirements of sewer and storm water structures. The material is designed for ease of use. Water is added to GeoSpray at the jobsite where it can be easily centrifugally sprayed inside an existing structure. The exact formulation of GeoSpray is a trade secret, but generally speaking it contains a mixture of the standard materials that are used in the production of calcium-aluminosilicates. Other components include, but are not limited to, blast furnace slag, reactive silicas, metal oxides, mine tailings, coal fly ash, metakaolin, calcinated shale, natural pozzolans and natural or processed zeolites. Additional bio-based admixtures are included in the formulation in order to allow the composite material to set up quickly and easily hydrate with a single addition of water. GeoSpray has been formulated to provide several key benefits to the contractor and asset owner. First, GeoSpray, unlike traditional geopolymers, is a “just add water” jobsite solution. Traditional geopolymer formulations require the alumino-silcates to be combined with a solution of sodium or potassium silicates that have been dissolved in water. With GeoSpray, the entire system is contained within original powder formulation, allowing a single step addition. Second, the proper selection of proprietary aggregates allows the GeoSpray to maintain easy pumpability up to 500 feet within a pipe and still be centrifugally cast without clogging or damaging nozzle performance. To achieve this standard of performance, traditional cement or geopolymer formulations would require much higher water ratios which would degrade their ultimate strength and require a much thicker final product during the installation to meet the flexural strength requirements of the rehabilitation. To apply GeoSpray in the field, the damaged pipe is cleaned in place, typically with high-pressure water blasting of 3,500 psi or more. In order to ensure adhesion of the GeoSpray to the damaged substrate, it is sometimes necessary to perform an additional cleaning with an environmentally- friendly detergent to remove excess oil and grease from the existing pipe walls. 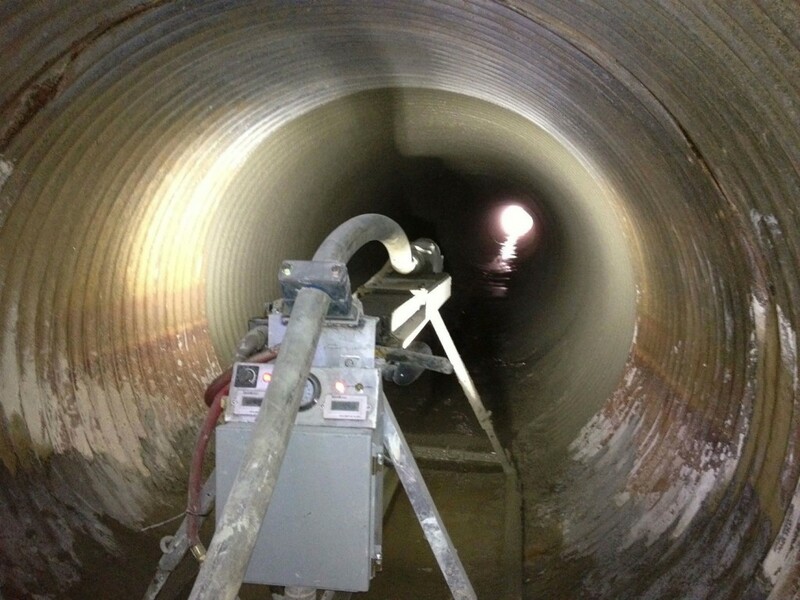 If there are large leaking holes, the pipe can be simply plugged with a thin application of the GeoSpray material or another plugging compounded. Finally, the geopolymer mortar is centrifugally-cast from atop a sled, which is slowly removed from the pipe to provide a uniform application. Typical application thicknesses range between 1.0 and 3 inches, depending on the type of pipe, local soil and water conditions, current condition of the existing pipe and the design life requirements of the particular pipe in question. GeoSpray has been installed for private and public asset owners in 27 U.S. states including California, Florida, Texas and Michigan, and eight other countries. All of the alternative technologies for replacing or relining sewer and storm water pipes rely mainly on the use of virgin raw materials. Whether it is a new pipe, CIPP made of non-woven textiles with styrene-based resins, or the use of Portland cement, all require new raw materials to provide adequate quality control of the final physical properties of the new or repaired infrastructure. Geopolymers have long been recognized as a safe and effective method for permanently binding inorganic waste streams. The GeoSpray geopolymer mortar contains over 60 percent post-industrial waste as the starting raw materials; a much greater percentage than can be incorporated in any of the other technologies. In addition, the metals and other minerals contained in these waste streams have been shown to not leach into the environment. A great amount of CO2 is emitted during the production of Portland cement. Life cycle analysis studies have shown that for every ton of Portland cement made anywhere in the world, approximately one ton of carbon dioxide is released into the atmosphere. In contrast, GeoSpray does not require extremely high-temperature treatment of the limestone but instead relies on a low-temperature processing of naturally occurring or direct man-made alumino-silicates (kaoline or fly ash). It was reported by Davidovits that about 60 percent less energy is required to produce a standard geopolymer as compared to Portland cement, and 80 to 90 percent less CO2 is emitted. It has been well established that the cost of trenchless technologies, where a pipe can be repaired instead of replaced, are significantly lower than dig and replace options. Estimates suggest trenchless technologies of any kind have a 50 to 70 percent advantage over the cost of opencut solutions. GeoSpray costs less than competing technologies including CIPP, says Milliken.